Dr Fredrick Schueler is a dedicated scientist, the longest-serving research associate of the Canadian Museum of Nature, and member of ORA. Fred is particularly interested in mussels found in the former outlet of the Upper Great Lakes, the Mattawa/Nippising/French system. He’s already added three species to those known from this area, and hopes to do more fieldwork there in 2015. Fred has requested that anyone with boats or cottages to send him bags full of empty clam shells. Fred will give you a very comprehensive report of what kind of mussels are living in your favourite lake or river – very exciting stuff! Also, if you have information of concerns about pipelines’ effects on rivers, Fred bckcdb@istar.ca or Aleta karstad@pinicola.ca would be interested in discussing this. 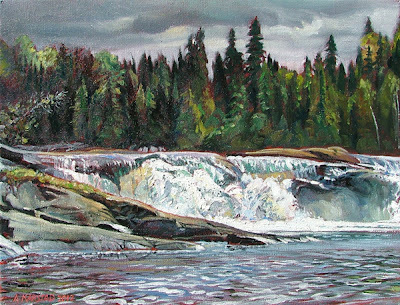 Aleta Karstad – The middle fall of Triple Falls on the east side of the Ivanhoe River, 40 km north of Foleyet, Ontario – another in our series of wild waterfalls threatened by hydro dams….. For full posting go to Aleta’s website. 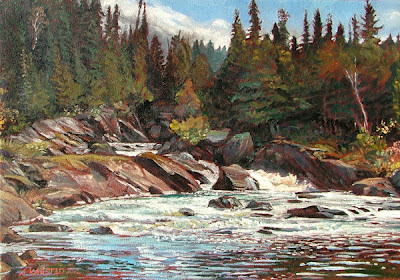 Aleta Karstad – The East shore of the Ivanhoe River below The Chutes, 16 km north of Foleyet, Ontario. Here the Ivanhoe spills, foaming, across a gneiss ledge above its clay riverbed. Behind me, runs around an island in Cedar/Poplar woods…… For full posting go to Aleta’s website. This painting is for sold. You may view the details and comments at http://karstaddailypaintings.blogspot.com. 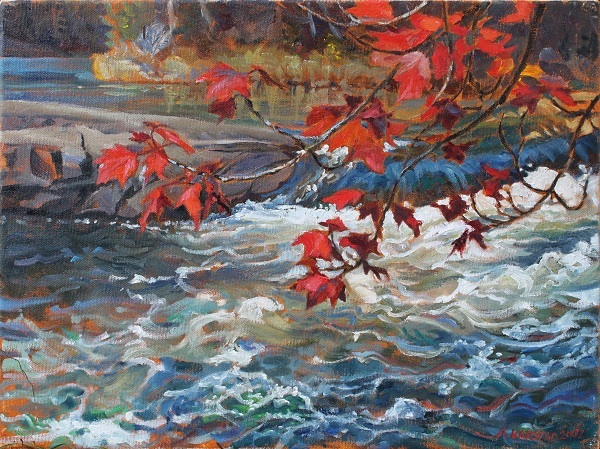 For information about purchasing or commissioning paintings, feel free to e-mail me at karstad@pinicola.ca or see http://karstaddailypaintings.blogspot.com/p/how-to-buy-karstad-biodiversity.html. This painting is for sold. You will find more information at http://karstaddailypaintings.blogspot.com. … or you can just file this message away in your own little thumbnail collection of Aleta’s daily paintings, and look forward to the next one, as we continue the 30 Years Later Expedition http://www.fragileinheritance.org/projects/thirty/thirtyintro.htm. Xeneca Power Development Inc. (Xeneca) is proposing to build a 4.67 MW modified peaking hydroelectric dam at Wanatango Falls, on the Frederick House River. This site is located approximately 26 km northwest of Iroquois Falls and 22 km south of Cochrane. Wanatango has been through the gauntlet once already in 2011 when Xeneca issued the Environmental Report (ER) and Notice of Completion for this proposal; however, the river was given a reprieve when the Ministry of Environment rejected another proposal on the Ivanhoe River because it was so lacking, and Xeneca was sent back to the drawing board to do more work. Xeneca was then given the opportunity to withdraw the ER for the Wanatango, and they complied. ORA is opposed to this development for the reasons set out in our 3 November 2011 letter to the Ministry of Environment’s office. Now Xeneca is close to completing their studies on the Wanatango and will soon issue the ER once again. 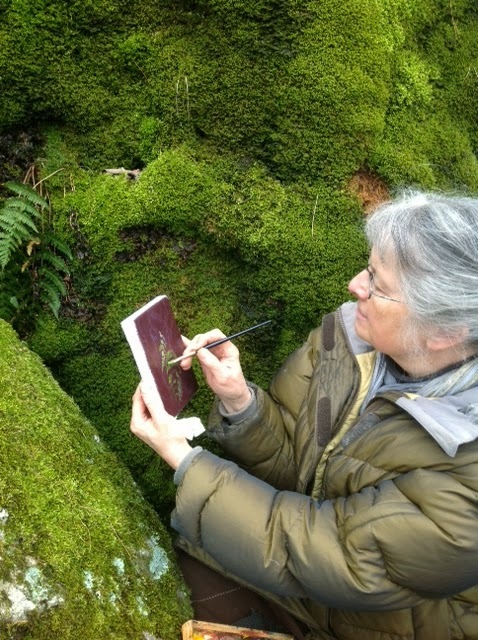 Aleta Karstad and her husband Frederick Schueler, of Fragile Inheritance http://www.fragileinheritance.org have travelled to Wanatango to study and paint, and hopefully draw attention to this beautiful set of falls that could be lost. It is very timely that Aleta and Fred are on a junket to visit several rivers at risk over the next several weeks – so stay tuned for more of Aleta’s beautiful paintings on http://www.aletakarstad.com.